This pair of cartes-de-visite record changes at the old Brick Corner. 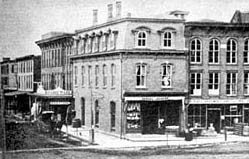 The earlier photograph was taken in February 1871 as Samuel Johnson prepared to rebuild his store at 1 Main Street. The old Brick Corner, demolished in March, had been built by Anson Potwine & Co. in 1822 and successively occupied by John Potwine, Vanderen & Longstreet, Backster & Bell, and by William Beach (who called it "Beachs Bazaar"). It was refitted in 1855 by William H. Johnson & Son. The low frame building to the rear on Spring Street had been used by Grant Fitch as the office of the New Jersey Herald in 1838, by Harmony Lodge and by Thomas Everitt as a harness shop. Park Hall, a brick building erected in 1856 by Goodale & Mills, stood above Johnson s Storehouse on Main Street. George Mills, hardware merchant, sold this storehouse to William Woodward in 1865. 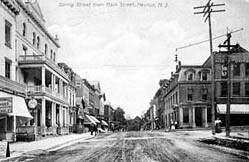 On Main Street above Park Hall, old wooden structures with brick fronts housed Mrs. Cramers Book and Fancy Store, Asenath Cumminss millinery and the residences of Dr. Levi Miller, Dr. Robert Sheppard and Dennis Cochran. In October 1871, Samuel Johnson completed his new storehouse in the Second Empire or Mansard style. Note the brick hood molds with rusticated keystone and corbeled stops. On September 23, 1873, fire destroyed the streetscape between Johnson s Storehouse and Library Hall. Johnsons building was emptied of its contents but firefighters on the roof successfully fought off the flames. These antique cartes-de-visite also offer a valuable view of the old storehouses along Spring Street. Masonic Hall at 108-110 Spring Street is a brick row storehouse with Italianate elaboration erected by Samuel Coursen in November 1856. Harmony Lodge leased rooms on the third story. An eschutcheon on the facade is inscribed: Masonic Hall A.D. 1857. In February 1865, Dr. John Stuart, Dr. David Sayre and pharmacist George Smith formed J.R. Stuart & Company and purchased the drug business of William Woodward in Masonic Hall. Note the painted wooden signboard, reading "Drugs and Medicines" and a wooden cut-out of a mortar and pestle. Major John Kraber, cabinetmaker, erected the brick row storehouse at 112 Spring Street in November 1856 for his Cabinet Manufactory and Sales Room. Sarah Cannon bought the premises in August 1866 and her husband, Peter Cannon, opened a Variety Store. In April 1857, Charles Crook located his Marble Yard at 116-118 Spring Street. The Snook Bakery at 120 Spring Street is a timber frame storehouse with Italianate elaboration, erected by Jacob Snook as a bakery in 1857. Franklin Smith sold the building to Lucy Graey in March 1871. George Leport assumed management of the bakery in November 1871, adding a ladies and gentlemens dining saloon in September 1872. The Snook Store-house at 124 Spring Street is another frame storehouse built by Jacob Snook in 1857. Owned by William Woodward and Samuel Johnson in 1871, it was occupied by Ackerson & Houghs meat market. Woodward's Hardware Store at 3 Main Steet and 106 Spring Steet is an L-shaped brick row storehouse with Italianate elaboration erected by hardware merchant William Woodward in 1874. He commissioned an architect to design a store of pressed brick with Nova Scotia stone trimmings. The cornice of galvanized iron was cast by Noyes & Wine of Centre Street, New York. For reasons of fire safety, windows were supplied with iron shutters. In May 1874, Robert Baughn, carpenter, and Absolom Price, mason, were employed to erect Woodward's new store. Henry Ogden Ryerson's Drugstore at 7 Main Street and the Charles Ewald Building at 9-11 Main Street were built in 1881. 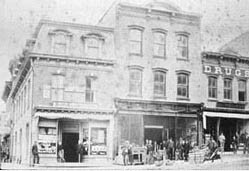 In July 1890, Walter Coriell leased half of the store room occupied by Wilmot D. Wright's jewelry store (9-11 Main Street) and opened the Newton Shoe Store. The first letters of Walter Coriell's name appear on the signboard at the edge of the photograph. Asenath Cummins Residence and Storehouse at 17 Main Street was constructed on the burnt lot in 1874. Demarest's book and stationery store occupied the small store room here between 1877 and 1890.